Waaaay back in January I posted about the Ole Henriksen Seven skincare sensations set that contains mini versions of seven of his products. I decided to start using the set as a complete skincare routine, but after a few days I discovered my skin was in a very sorry state. It had been completely stripped of moisture and some patches were so dry you could actually see lines in my skin. Don't ask me how I didn't notice it getting so bad, but I didn't. I stopped using all of the products immediately and returned to my previous routine to try and help my skin recover. I worked out that it was the African red tea foaming cleanser that was the problem, the key word here obviously being 'foaming'. I have dry skin, but hadn't tried a foaming cleanser before or read anything about them, so I didn't realise what they could be like. Although I identified the product that I was sure was causing the problem I didn't go back to trying any of the other products again until recently. I've had my eye on The Body Shop's Vitamin C skin reviver for a while now but haven't really been able to afford it, so obviously it's been pretty much all I can think about! Then I remember that I had this tucked away somewhere so I hunted it out. I'd previously tried a sample sachet of the Truth revealed super creme, which I assume is part of the same range of products, and I loved it so I really wanted to give this a try. As the name suggests, there's vitamin C in there to calm, heal and strengthen collagen. There's also vitamin E to heal restore and nourish, rosehip to repair and strengthen, green tea to protect against environmental damage, grapefruit and orange extract to purify and brighten and finally sodium hyaluronate to bind moisture to the skin. The serum is dispensed through a small hole, but let me warn you, that little hole has anger issues and no matter how hard I try to stop it the little fella always spits! I apply one pump onto my finger tips but I always end up with up with a little bit either squirting over onto the palm of my hand, or if I'm unlucky, right across the room. One of the things I love most about this is the smell. It smells just like refreshers, all kind of citrus-y and fizzy and it's amazing. As you apply it sinks in within a few seconds and does initially leave a slightly sticky feeling, but I just leave it for another couple of seconds and this disappears leaving behind smooth, lightly moisturised, slightly plumper and refreshed skin (that must be the 'refreshers'!). I do like this, but do I like it enough to pay around £50 for 30ml? Aside from the fact that I can't afford that anyway I don't think I would. My sample is 15ml, so half the size of the full size, and I seem to be getting through it quite quickly despite only using it once a day and not every day. It's a nice product but I think it's a little very expensive and I think I'll give The Body Shop's version a try next. 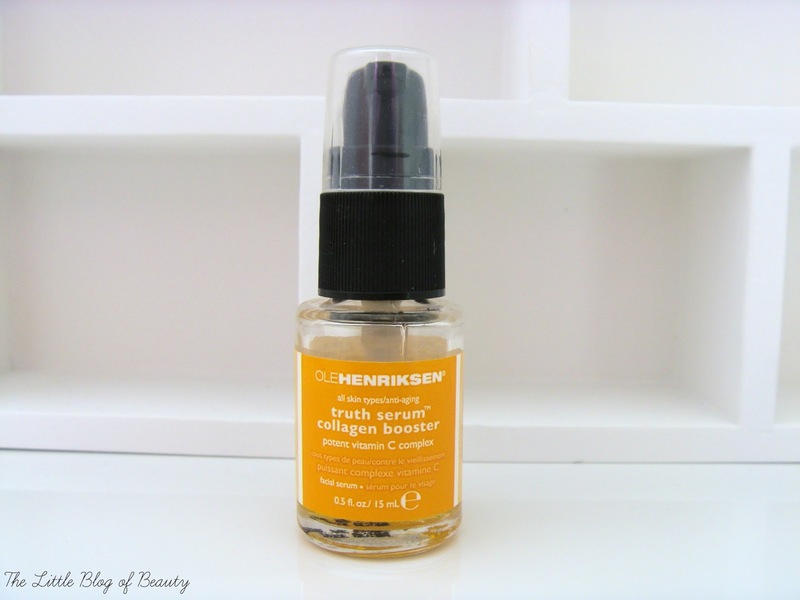 Have you tried any Ole Henriksen products?